Upper Dolpo 18 days trek is a moderate trek. Travelers who can walk up to 6-7 hours a day on an uphill and downhill trail will find this trek fulfilling. It is best that we prepare ourselves for the Annapurna trek by jogging and exercising regularly at least a month prior to the start of the trek. Trekking to the Everest Base Camp should be relatively easier for those who have experience walking/trekking in a high altitude environment. Past hiking experience would be an asset but no technical skill is required for this trip. It is also important that we consult our doctor. Participants with pre-existing medical conditions such as heart, lung, and blood diseases should inform Discovery Mountai Trek before booking the trek. The best time to trek to the Upper Dolpo Trek is Spring (February to May) and Autumn (September to November). The temperature is moderate in these seasons and guarantees amazing views through the trip. Although this trek can be undertaken during winter, the cold temperature might not be suitable for everyone. Upper Dolpo Trekking takes us to the frontier of Tibet beyond Nepal Himalayas. The settlements in Upper Dolpo region are one of the highest settlements on the earth. Mostly, the cultural and economic sustainability is very closely connected to Tibet. The scattered fortresses-like villages and holy monasteries in arid landscapes of Upper Dolpo are spectacular. 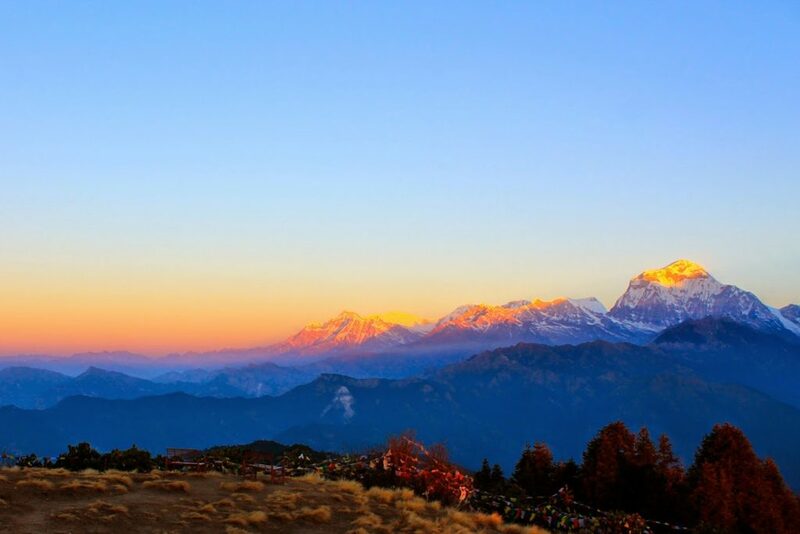 It is one of the remote area and wilderness trekking trail in Nepal which is located in the far western region. This region is still to be explored. Upper Dolpo region still lacks developmental works by the central government. Thus, it is not flamed by the so – called globalization and modernization yet. This trekking from north-west region behind the Dhaulagiri massif to the Tibetan plateau. The Himalayan wildlife, including, Musk Deer, Himalayan Blue Sheep and rare Snow Leopard are native in this region for the trail is protected by Shey Phoksundo National Park. We can experience rich dialect culture and civilization mostly influenced by Tibet. Upper Dolpo region trekking is known as forbidden kingdom trekking therefore trekkers require a special and restricted area permit to enter this region. There are abundance and less exposed mysteries to dig out during the trip. We start our visit in the morning of the most historical and spiritual attractions in Kathmandu, the sacred Hindu temple of Pashupatinath, . back to the hotel and transfer to domestic airport for 50 minutes scenic flight to Nepal’s South West region at Nepalgunj close to the border of India, where the temperature are warm of sub-tropical climate on reaching at Nepalgunj transfer to respective hotels. Morning a short drive from the hotel to Nepalgunj airport for the connecting short scenic flight to Jhuphal which takes about 40 mins, on the flight super panorama of Dhaulagiri mountain range, on reaching Jhuphal, our field and trekking crews will meet and then with a short drive on the jeep track road to Dunai for overnight stop, Dunai a moderate size and a headquarter town with Government administrative of Dolpo region. We start our trek after breakfast with the first day walk by crossing a suspension bridge and then leading towards North West with a climb to the banks of Thulo Bheri Valley, after a while it leads to a ridge at Phoksumdo river valley at 2,499 meters, with magnificent views of Kagmara Peak, then walking on the path with a long downhill through several scattered houses and walnut groves near to a stream, then reaching at Dhera a small winter settlements of cattle herders, from here climbing to Rahagaon village inhabited mostly by Thakuri, a Hindu tribe of people of the Western Himalaya mid hills, after Rahagaon walking downhill towards a dense forests, reaching at Ankhe for overnight camp, this small place is the main entrance to Shey Phoksumdo National Park, afternoon at leisure for short walk around this nice area. Morning from Ankhe starts with short ups and downhill walks into a forest and then to river side, then climbing to a ridge leaving behind the forested area high above the river, after the ridge top descending back to forest area to another riverbeds. From here walk leads to an upstream then crossing a small bridge near Ryajik village, after this village walking further towards our overnight camp at Sumdu near Sulighat village with time for short visit around this nice small village. Today our walk leads to one of the highlight of this trip to a beautiful emerald Phokshumdo lake, starting the morning walk into the valley of Phokshumdo and Pungmo Kholas (streams) confluence, after crossing the western side of Phokshumdo Khola, and then following the Pungmo Khola west bank, after a nice and pleasant rest stops, walk leads on the downhill path through birch and pine forests towards upper side of Phokshumdo Khola, and then finally reaching at Ringmo village, this is one of the interesting and attractive village with mud plastered chortens and Mani (prayer) walls, from this nice village a short walk towards the enchanting, turquoise and emerald colored Phokshumdo Lake, overnight camp near the bank of this beautiful lake. An important and necessary rest day at Ringmo and Phokshumdo Lake for acclimatization before heading higher area, this is an ideal spot for free day around this place one take an optional walk or visit the Ringmo village and its old interesting Buddhist Monastery along with stunning views of surrounding landscapes and snow capped mountains. After an enjoyable and interesting time at Ringmo village and Phokshumdo lake, today’s walk leads to other side of Dolpo area towards east by an alternative way crossing few passes, starting the morning walk on a pleasant and gradual trail and then leading to an uphill climb to cross over Baga-la at 5,070 meters, with steep climb for about 03 hours to reach the top of the pass, the top offers overwhelming panorama of Phoksumdo lake and Kagmara peaks, after a great scenery walk leads to a long descend to our overnight camp to phedi, meaning base or a bottom of the hills. From this camp, morning walk leads to another pass at Numa-la at 5,190 meters, the highest spot of this awesome trip, walk leads to a climb on the nice grassy slopes for about three hours then reaching the top of Numa-la with impressive views of snow capped mountains from Dhaulagiri mountain range to Kagmara peak and looking down at beautiful valleys and surrounding dramatic landscapes, after an enjoyable moment descend to the base of this high pass, then with few hours of good walk on the gradual path to our overnight camp on the summer pasture fields and meadows. After being few days in total isolation away from the village, today’s walk leads to an interesting village at Tokyu Gaon, one of the largest village of this region, starting the morning with a steep climb for near two hours at the top of Jeng – la with panoramic views of snow capped mountains looking at the North Face of Mt. Dhaulagiri massif range of peaks, after enjoying the awesome scenery, walk leads to a long descend towards Tarap valley, which is one of the longest beautiful green valley extending near about 20 k.m. distances along the Tarap Chu River, with more than 10 villages with well tended farm fields with monasteries and chortens, then walking on a pleasant trail after completing the downhill portion to reach our overnight stop at Tokyugaon a wonderful village with an old interesting monastery, afternoon with ample time to visit the village and the monastery or just relax and interact with the locals. From this nice village, morning walk follows on the downhill path towards Tarap Chu into a wide valley, around this picturesque valley with temporary settlements of local cattle herders, the people here belongs to both Bon Po and Chaiba sects of Tibetan Buddhism (Mahyana) living together in friendly harmony. Then with a good nice walk on this beautiful valley reaching at Dho Tarap for overnight camp, afternoon with time for local visit around this interesting village which is inhabited by Tibetans origin people and with mostly Magar hill tribe. On the long day walk but with moderate and gradual trail with few short climb and down hills, morning starts with a descent into a wide valley which further narrows into a gorge. Following the path with sparse vegetation of juniper and wild rose bushes which is typical in this dry barren area of inner Himalaya climate and arctic temperate zone, around this place chances of spotting some wild life including herds of blue sheep’s, after a great enjoyable walk reaching at the junction of Tarap Chu and Lang Khola, flowing from Tarap River beyond east, source of the river from the glacier of North West Dhaulagiri Himalayan range of mountains. After a nice and pleasant walk reaching to a beautiful grassy field a meadow or a summer pasture which is called Kamekharka, the word Khaka meaning shelter or shades of the Sheppard’s. After a nice morning in this wonderful surrounding, walk leads towards Tarap River and into a gorge, rising above from the path built on steep slopes. This narrow gorge offers some challenge and with an adventure as the path in some places with damaged broken bridge by river floods, and sometimes wading across the chilly river on foot, after some adventure and excitement this fine day walk reaches at Tarap- khola near Kharigaon for overnight camping. This exotic journey carry’s on reaching at lower Dolpo area through Lalberi village and then back into tree lines on the trail following the river again downstream to Tarakot village, this picturesque village with a nice terraced cultivated fields and an old fortress around this village- town’. (over hundred years ago, before the Gorkha dynasty, this beautiful was the capital and had Dzong meaning Fort). Tarakot village houses the famous Sandul Gompa, located at the confluence of Barbung Khola and Tarap Chum after an interesting detour and with a visit of Tarakot village, walking down from the village to our overnight camp near by the river just below the village close to a monastery at the edge of a grassy plateau, with an interesting solitary tree. This remarkable and finest journey slowly comes to an end at Jhupal, the gateway to Dolpo and many other destination on this far west region, starting this final days walk to Dunai following several scattered farm villages and cattle herders shades and huts, then leading to a gradual uphill to a valley and then with a descend to the other side on the barren treeless landscapes at Thulo Bheri valley at Dunai area, from here walking past a hospital to cross the new suspension bridge then finally reaching at Dunai town, a large town area with an administrative headquarter of Dolpo zone, to make this walk shorter and to reach Jhupal on time to check with our flight taking a jeep ride for an hour drive on the dirt rough road to Jhuphal for the last and final overnight stop of this impressive journey at Jhupal with time for short walk around this village. Early morning, depending upon the flight time get in a small plane Dronier or Twin Otter or similar type for a short scenic flight of 40 minutes to Nepalgunj with awesome panorama of Mt. Annapurna and Mt. Dhaulagiri range of mountains, on reaching at Nepalgunj depending upon the connecting flight to Kathmandu, with few hours of rest and refreshment at Nepalgunj, then connect the flight to Kathmandu which takes almost 5 minutes with sweeping panorama of mountain range from the plane, then finally concluding this fantastic journey in Kathmandu, on arrival transfer to respective hotels with afternoon free at leisure. Today after breakfast we will start visit you to several of the most historical and spiritual attractions in Kathmandu which are also listed as UNESCO World Heritage sites. you visit the historic Durbar Square, the famous ‘Monkey Temple’ (Swayambhunath) and Buddhist shrine (Bouddhanath), which is also one of the largest stupas in the world.